In the beginning of June, we told you about UNIFICATION 2010, an event jointly celebrating Pakistan and India’s independence days on August 14th that will showcase the talent of South Asian American artists from across the country. We interviewed brother-sister dream pop duo Fair and Kind, who will be performing at the event next month. In 2007, Anand Subramanian and his sister, Arthi Meera, moved to L.A. to make some music. The result was Fair and Kind, which showcases Meera’s gorgeous, haunting voice as well as her brother’s soulful tones. 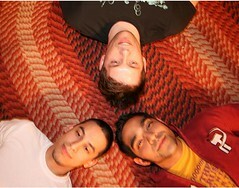 Their music has been called “sparking” and “adorable” by reviewers. (But forget pretty adjectives, do yourself a favor and just listen to their debut album for yourself.) Anand talked to MTV Iggy about the group, their plans for the future and why Fair and Kind is playing at UNIFICATION 2010. In 2008, you self-released your debut album A Little Past Twilight. According to your website, your second album is tentatively titled Light Music Program. When do you hope to release that? We were hoping to release the next album at the end of 2010, but it’s been a busy year for us, so probably early/mid 2011. Why did you feel it was important to be involved in UNIFICATION 2010? I think it’s important to work towards building South Asian solidarity and I love the idea of South Asian artist showcases. Part of the reason we decided to move to LA to start Fair and Kind back in 2007 was to try and collaborate with the community of talented South Asian artists we knew there. Do you have any other siblings or is just you two? If you have other siblings, can you see them joining you in your musical pursuits? It’s just us two, but we have an extended family in Chicago (cousins, etc. ), who are all musically talented. We’d like to get them involved with the recording of the 2nd album, but we’re still working out the details. What do your parents think about your music? Do they come to your shows? Our parents are supportive in every way. In 2009, we played our only show in Chicago (where they live), and they were at the very front, even though it was super loud. You both live in separate cities. How do you still manage to collaborate on your music? The internet has been very helpful. We record ideas at home and send them back and forth. We’ve also been lucky enough to travel to each others’ cities (Chicago and Oakland) a few times to work on stuff. The first album was written and recorded when we both lived in LA, so it’s still a process we’re trying to figure out. How will your second album differ from your first? I don’t think there’ll be a radical departure in sound, but we want to try and capture some of our favorite things about the ‘80s and ‘90s Tamil film music we heard when we visited India and somehow incorporate those things into the album. This process will probably be explicit on some songs and more subtle in others. Yeah…we had been toying around with a play on “Fair and Lovely,” and then that line in the Diwali episode of The Office (US) really triggered the notion of emphasizing the other meaning of the word “fair.” Ultimately, it just felt right. Who performs what role in the duo? For instance, do you both contribute to the songwriting process, etc? We both sing and play electric and acoustic guitars. On the album, I played bass and other instruments as well. We both write music, usually collaborating on every song. We both also write the lyrics, usually independently, but sometimes collaborating. Will Fair and Kind ever add other folks to the group? We were actually a four piece in LA (we had a bassist and drummer), but it’d be hard to maintain more members given our current geographical limitations. We definitely hope to have additional touring musicians when we promote the next album. According to the latest installment of their monthly newsletter, dreamy pop duo Fair and Kind are hard at work writing the follow up to their 2009 effort A Little Past Twilight. Band members Arthi Meera and Anand Subramanian are currently in Oakland demoing parts for the new record, tentatively titled, Light Music Program. Additionally, the band is offering a free download of an acoustic version of a new track titled “Before All Beginning” right now. Just heard over to their Web site, Fairandkind.com, and enter your e-mail in the “Free Download” widget in the middle of the page, hit submit and find the free MP3 in your inbox moments later. No word on if “Before All Beginning” will appear on their next release. For a duo, My Gold Mask have probably one of the most layered, hauntingly orchestrated sounds you will ever hear. Seriously, White Stripes - eat your hearts out. Comprised of the multi-talented Jack Armondo and the seductive soulstress Gretta Rochelle, whose voice ranges from high pitched Karen O squeals to a low burning croon, My Gold Mask is set for prime time as they ready the release of their brand new EP A Thousand Voices. You can check out their record release party this Saturday at The Hideout. Mako Sica’s debut on Permanent Record’s house label was a rare treat of patience that never got boring and experimentation that never got too out there as to lose cohesion. Twenty-ten sees the band releasing a proper studio album, Dark Horizon, on La Societe Expeditionnaire. Their style might not gain them huge notoriety. 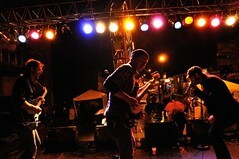 But in a city willing to embrace all manners of musical expression, they’re sure to be on many folk’s radar. If you’re a fan of genre bending experimentation and psych jam freak-outs keep your eyes peeled for Mako Sica in 2010. Chicago’s experimental post-rockers, The Gorilla Press, continue to make great impressions all around the city. Since the release of their first self-titled album, The Gorilla Press has been continuously playing bigger shows, writing for a second album and working on music videos with director Ichiro Hino. Only months after releasing the video for “Abuse Your Sight”, Hino was off and running again with “Anger In The Drains” expected to be out in February. The band has decided to hunker down for the winter and work on recording their second album expected out this coming year. The Gorilla Press has grown in leaps and bounds and is absolutely a Chicago band to keep and eye on this coming year. The Gorilla Press is out now on their website. Bailiff offer one of the heaviest and hard hitting blues rock sounds this side of Nashville, and their riffs, powered by guitarist Josh Siegel, often have more in common with Queens Of The Stone Age or Kyuss than Muddy Waters. Their sound is even more fleshed out now as they’ve finally added a bassist in Adam Schneider after a long and exhausting search, which is the excellent news for drummer Ren Mathew whose ever-so-tight back beat finally has a low end to make Bailiff’s grooves even more menacing. 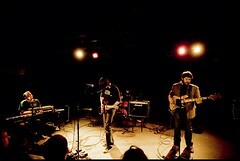 Bailiff are making their 2010 live debut this Saturday at Lincoln Hall, so be there. Adorable and sparkly, Fair and Kind made quite an impression on fans with their first album A Little Past Twilight. After a summer tour filled with gorgeous mix of dream pop/shoe gaze and Arthi Meera’s perfectly beautiful voice, both Arthi and Anand Subramanian settled down for the winter and started writing again. We here at Loud Loop are poised and ready for their second album possibly titled Light Music Program. The collaboration of this brother, sister duo has made headlines more than once with us by writing songs for movie soundtracks, and becoming a part of Pandora. We expect more great things from them again this year. A Little Past Twilight is out now on Fairandkind.com. Never has a dance rock band sounded so sinister until The Streets On Fire came along with their highly impressive debut Hot Weekend. A bouncy rhythm section gives way to angular and frantic guitar riffs as lead singer Chadwick spouts his gnarled, rambling messages over it all. It’s fun yet dark and, at times, nearly psychotic. Check out The Streets On Fire on January 27 at the Double Door. Twenty-ten might be the year of boy-girl duos. Another of Chicago’s best is husband and wife indie-folk duo Puerto Muerto, which will release their new LP, Drumming For Pistol in February. The title track has already been released, and it’s pretty epic with Christa Meyer’s vocals leading the way along as Tim Kelley’s big climactic guitar strums. Plus, they’ll be touring North America this year with a full band, so that’ll will be pretty awesome, no doubt. Where to begin with Earth Program? One of the most unique, quirky, and unbelievably solid bands in Chicago’s scene, Earth Program is something that everyone can love. Although they describe their music as post-punk/indie pop, I would have to say they are a little more complex than that. They start with loads of reverb on the microphones with vocals that sound Perry Farrel-esque (only with more insanity) and then add in a little psychedelic surf rock for kicks. They continue by screaming, “You know you really don’t like me” at the audience. Earth Program displays many faces and is constantly taking listeners on a ride. Stage antics are a must for Earth Program. If it’s not costumes, then it’s wild dancing and stomping. It’s captivating and relentless and wonderful. Catch Earth Program on January 29 at Ronny’s. A little dreamy surf rock, a little power pop, the occasional waltz and lots of screaming good fun make up the sound of The Sweeps. Just coming off of their recent, massive Midwest tour, the trio is making their way in the Chicago scene. The future holds both tv appearances, and endless shows for The Sweeps. On stage, The Sweeps could never disappoint. Their songs are catchy, their stage presence is amazing and the energy from their fans is intoxicating. Check out The Sweeps on January 16 at the Double Door. Four guys that all used to live in Ohio and one by one made their way to Chicago, We Love You play the kind of slightly off-kilter indie rock some of us grew up on. Think Archers of Loaf and you’ll know what I’m talking about. In a short period, Derek (guitars/vocals), Matt (drums), Nick (bass), and Zach (guitar) have written some pretty catchy tunes and hit the local scene running. At this pace you may have no choice but to hop on the bandwagon in 2010. Feel the love when We Love You hit the Subterranean on January 20. Los Angeles and Chicago’s dreamy hybrid-child, Fair and Kind, have made it to everyone’s favorite intelligent internet radio station, Pandora, where you can now tune into the “Fair and Kind” station to hear artists who create similar lush pop sounds. Just a few of the artist’s Pandora found to be similar to the brother-sister duo of Anand Subramanian and Arthi Meera and their very impressive debut album A Little Past Twilight were Rilo Kiley, Sixpence None The Richer, and The High Violets. It doesn’t take too much of a stretch to see where Pandora links the similarities between these artists and Fair and Kind. Other than the obvious male/female vocals shared between Fair and Kind and Rilo Kiley, a bit of Rilo Kiley’s modern folk sound with wistful melodies and catchy refrains are found within Fair and Kind’s music. Arthi Meera’s beautifully clear-as-a-bell vocals can be compared to both Sixpence None the Richer and The High Violets. This small, seemingly unobtrusive step into the behemoth that is Pandora may very well launch Fair and Kind’s musical career into the stratosphere. 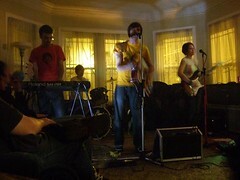 The duo is also offering a free download on their Web site for a demo of their new song “Dim,” which they describe as “our first foray into long-distance home recording.” Additionally, Fair and Kind’s debut effort A Little Past Twilight can be also be streamed and purchased at Fairandkind.com. Fair and Kind, Chicago’s dreamy pop duo comprised of siblings Arthi Meera and Anand Subramanian, will have their new song, “Where Love Grows,” featured in the upcoming independent feature film Raspberry Magic. Raspberry Magic was written and directed by Leena Pendharkar and produced by Megha Kadakia. By looking at the trailer, which you can view at http://raspberrymagic.com, the film seems to be a metaphor-filled drama revolving around a young girl’s love for raspberries during a rough patch in her parent’s marriage. An excellent platform for the meditative and lavish melodies from Fair and Kind, I’d say. “Where Love Grows” was co-produced by Jessie Clark, who also scored the Raspberry Magic soundtrack, and was mixed by Jamie Seyberth, who engineered and co-produced Fair and Kind’s debut album, A Little Past Twilight. You can download the track “Where Love Grows” on Fairandkind.com right now. Life comes at you fast, and so does great local music. Welcome to the first edition of Sudden Shows. Performing tonight at the Tonic Room is Fair and Kind, a collaboration of two talented musicians, both unique and accomplished in their own rights and who also happen to be related. The sister-brother duo of Arthi and Anand create Fair and Kind. 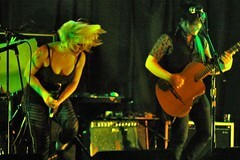 The two grew up in Chicago and have been influenced by 80s pop and world music alike. Their first album, A Little Past Twilight was recorded last year in Los Angeles and available through their website and on iTunes. Their music is powerful and focused, depending on beautiful and rhythmic guitar tracks that seem to grow and multiply through the course of the songs. The swell of music is tempered by Arthi’s consistently elegant vocals and the resulting dichotomy is the well tuned product of years learning music together. This is the only show they have scheduled in the near future and if you’ve never been, The Tonic Room is a great place to see music. Small, dark, great beer and a petri dish for creative cultures. It’s the perfect evening show to help you forget your Monday. You can find the music at 2447 N. Halsted. Doors open at 8 pm, cover is a paltry 5 bucks and Fair and Kind will be joined by Adam Hitchell and The Gorilla Press. And in October 2008, Fair and Kind—the duo of Arthi and her brother, Anand Subramanian—released its debut CD, A Little Past Twilight. Arthi’s voice is clean and pure with zero vibrato. Anand’s voice is reminiscent of that of Dan Haseltine of Jars of Clay, and the two siblings’ voices complement each other beautifully. I first interviewed Arthi for India Currents during summer 2007 (“A New Voice: An Interview with Singer-Songwriter Arthi Meera,” June 2007). At that time, she had just released her self-titled debut solo CD, and she had begun working with Anand under the name Fair and Kind. In this recent conversation with Arthi, we discuss her just-completed tour with 1997, the debut album of Fair and Kind, and her upcoming plans. I understand that the tour with 1997 was your first national tour. What did you enjoy about it? I loved being in a different city every night. I loved meeting all of these people I would not have otherwise met. We traveled in a van, with a trailer for our equipment. There were seven of us—the five guys in the band, me, and a merch (merchandise) girl. (laughs) It was a life-saver having another girl there! Did you all get on one another’s nerves? These guys have known one another since high school, so they are like a family. Once I got used to being with them, it was great—it was like having five little brothers! Certainly, little brothers can sometimes be annoying, but at the end of the day you love them. What did you dislike about touring? Driving at night meant that you couldn’t see the country. For example, in the west we’d be driving all night through the mountains, and you could tell we were driving through mountains but you couldn’t experience their beauty . What did you and the band do for lodging? We mostly stayed with fans. Sometimes fans would buy us hotel rooms. When we spent nights on the road, I didn’t mind sleeping in the van. There was a bench in the back of the van that I liked. And I had an amazing sleeping bag that I bought for only 30 bucks! Did you learn anything technical from the tour? I learned how to properly sing into a mic when you can’t hear yourself well. We didn’t always have a good mix through our monitors, and a rock band can get really loud. Learning how to sing under those circumstances was really useful. Have you started working on your second solo album yet? I’ve written most of the songs and now I’m practicing them. I expect to start recording in early 2009. Also in 2009 I’ll be playing solo shows with a full band around Chicago and regionally. Let’s discuss a few of the tracks on A Little Past Twilight. Why did you open the album with “The Signal”? We opened and closed the album with “The Signal” and “Last Song for Now” respectively because they both exemplified the airy, dream-pop sound we were going for with the album. In “November,” you and Anand sing the same notes an octave apart through the entire song. Yes, a lot of bands with a male and female singer do that. We love that sound, but we didn’t want to overdo it, so we limited that technique to that song. “When We’re Good” has a different feel from the other tracks. Yes, we wanted that song to sound like a ghost prom. (laughs) You know, a prom for ghosts! Or maybe the regular prom is over and then the ghosts come out and have their prom. Now that you say that, I can actually picture ghosts slow-dancing to the song! So what’s next for Fair and Kind? 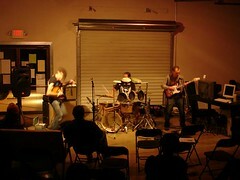 In 2009 we’d love to do a few mini-tours in the United States, as well as some acoustic shows in India. In the meantime, we’ll try to get the album out there, try to get it written up in blogs, and so on. Is there a story behind the name Fair and Kind?